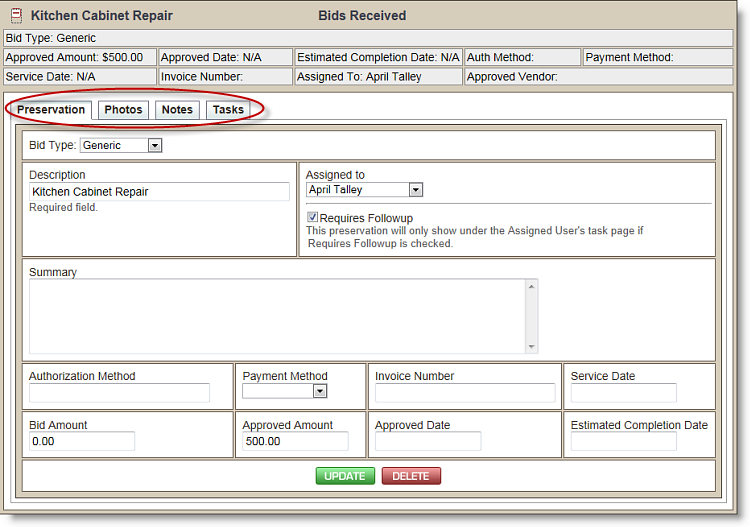 The Home>Preservations tab shows all preservations which have been assigned to you for follow-up. Note that each preservation is sorted by property address. If you click the + next to a preservation name, the preservation will expand to show more detail. In the screen shot below, we expanded the Kitchen Cabinet Repair preservation. You can make changes to the preservation by adding or modifying information in any field shown and clicking the Update button at the bottom of the screen. Once expanded, there are four sub tabs you can access from here: Preservation, Photos, Notes, and Tasks. For detailed information on using these tabs, see Properties>Preservation. If you wish to work with a preservation's bids, change the preservation status, or add forms, photos, or expenses, you must do so from the Properties>Preservation tab. You can quickly go there by clicking the property address shown in the box above the preservation. To remove a preservation from your Home tab, uncheck the Requires Followup box and click the green Update button.